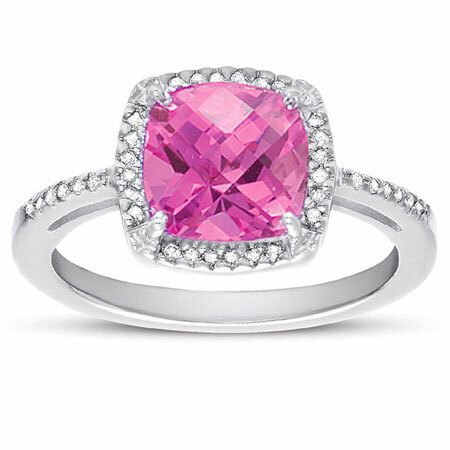 Absolutely outstanding and very amazing is an apt description of this cushion-cut pink topaz ring. The ring's elegant simplicity is very eye-catching as the band is crafted from 925 sterling silver and maintains a slender form all around while accommodating diamonds throughout its upper half. Sitting right on top of the ring is a base fashioned from same sterling silver with four very stylish prongs curving to secure the cushion-cut pink quartz gemstone which measures 8mm x 8mm. The halo effect is caused by the surrounding diamonds on the base and throughout the ring. These 0.11 Carat diamonds, numbering 36 shimmer and light up the ring. We guarantee our Cushion-Cut Pink Topaz and Diamond Halo Ring in Sterling Silver to be high quality, authentic jewelry, as described above.